Purpose: Elevated intraocular pressure (IOP) is the only known modifiable risk factor for primary open angle glaucoma (POAG), and it can be caused by reduced aqueous humor outflow from the anterior chamber. Outflow is predominantly regulated by the trabecular meshwork, consisting of specialized cells within a complex extracellular matrix (ECM). An imbalance between ECM-degrading matrix metalloproteinases (MMPs) and the tissue inhibitors of MMPs (TIMPs) within the trabecular meshwork is thought to contribute to POAG. This study aimed to quantify levels of TIMPs and MMPs in aqueous humor samples from glaucomatous and non-glaucomatous eyes, analyze MMP/TIMP ratios, and correlate results with age, IOP, and Humphrey抯 visual field pattern standard deviation (PSD). 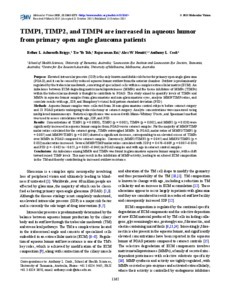 Methods: Aqueous humor samples were collected from 26 non-glaucomatous control subjects before cataract surgery and 23 POAG patients undergoing trabeculectomy or cataract surgery. Analyte concentrations were measured using multiplexed immunoassays. Statistical significance was assessed with Mann朩hitney U tests, and Spearman抯 method was used to assess correlations with age, IOP, and PSD. Results: Concentrations of TIMP1 (p = 0.0008), TIMP2 (p = 0.002), TIMP4 (p = 0.002), and MMP2 (p = 0.020) were significantly increased in aqueous humor samples from POAG versus cataract samples. For the majority of MMP/TIMP molar ratios calculated for the cataract group, TIMPs outweighed MMPs. In POAG, molar ratios of MMP2/TIMP1 (p = 0.007) and MMP9/TIMP1 (p = 0.005) showed a significant decrease, corresponding to an elevated excess of TIMPs over MMPs in POAG compared to cataract samples. Conversely, MMP2/TIMP3 (p = 0.045) and MMP3/TIMP3 (p = 0.032) molar ratios increased. Several MMP/TIMP molar ratios correlated with IOP (r = 0.476�609, p = 0.007�034) and PSD (r = -0.482 to −0.655, p = 0.005�046) in POAG samples and with age in cataract control samples. Conclusions: An imbalance among MMPs and TIMPs was found in glaucomatous aqueous humor samples, with a shift toward raised TIMP levels. This may result in the inhibition of MMP activity, leading to an altered ECM composition in the TM and thereby contributing to increased outflow resistance.